How much does it cost to travel to Glencoe? How much money will you need in Glencoe? £94 ($122) is the average daily price for traveling in Glencoe. The average price of food for one day is £26 ($34). The average price of a hotel for a couple is £94 ($122). Additional pricing is in the table below. These average travel prices have been collected from other travelers to help you plan your own travel budget. How much money do I need for Glencoe? Glencoe is a picturesque valley in the western highlands of Scotland that has grown to fame due to its incredible natural beauty. The valley has been the setting for many films over the years, including Monty Python and Harry Potter, because of its fantastic scenery that you can explore yourself on a trip through the valley. Whether or not you're a movie buff, everyone can enjoy the landscapes carved out by ancient volcanoes and the activities that go along with it! During the winter, from November to March, the valley is usually covered in snow and tends to stay in the 30's Fahrenheit. Summer, from June to September, is great for hiking the valley and exploring as temperatures are in the 60's Fahrenheit. 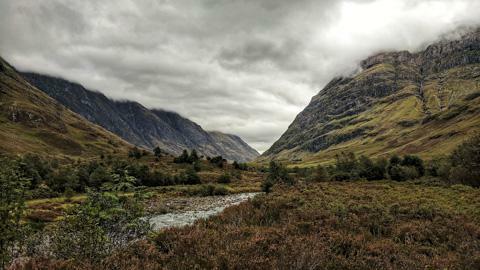 One of the best ways to see Glencoe is by taking one of the walking paths that wind through the valley. Many of the walks start from the Glencoe Visitor Center where you can learn about the history of the area and even find out where some of your favorite movie scenes were shot! One such area is the Glenfinnan viaduct, where many of the famous train scenes from Harry Potter were shot. After viewing the viaduct, walk across the road to the Glenfinnan Monument where you'll find incredible views of the surrounding mountains and lochs. From here, head to the Three Sisters of Glencoe, a series of sharp mountains that offer a breathtaking example of Scotland's natural beauty. Glencoe Valley has just a few towns: Glencoe Village, Kinlochleven, and Fort William. Glencoe Village is a tiny village on the glen that features an outdoor center, accommodation, restaurants, and the Glencoe Visitor Center. Kinlochleven is a popular village to use as a basecamp for walkers who trek the 10 munro mountains in the area. There is plentiful accommodation in Kinlochleven and a few small restaurants and shops. Fort William is one of the largest towns in the Highlands and offers the largest number of restaurant and accommodation options. Glencoe is often considered to be the outdoor capital of the UK, making it the perfect place to enjoy the best outdoor activities Scotland has to offer. You can rent a bicycle from Crankitupgear and go cycling through the heart of the Highlands or rent a kayak and take a trip through Loch Leven. You can easily take one of the many trails through the munros or take a big hike up Ben Nevis. If you want something more adventurous, head to Ice Factor where you can go rock climbing or ice climbing. The Stramash company in Oban offers a bigger adrenaline rush with their coasteering adventures where you climb, swim, jump, and scramble along the coastline of Glencoe. If you prefer to let others do the activities, head to the Highland Games in Glenfinnan at the end of August to enjoy the centuries old tradition. Restaurants in the area range from being attached to inns and hotels to standalone restaurants in the center of the villages. Most restaurants serve traditional Scottish meals that feature a lot of lamb, fish, and potatoes. There are a decent number of restaurants and cafes in the area, most of which are very laid back and serve the usual pub food or seafood. If you prefer something lighter, Fort William is home to a Thai restaurant and there are a few cafes that serve light sandwiches. If you need to stock up on food for a trekking trip, Fort William has the most grocery store options. The best way to get into Glencoe Valley is via car or bus from Edinburgh or Glasgow. You can also do a day trip to Glencoe using a stagecoach service that usually leaves from Edinburgh or Glasgow. Getting around Glencoe is easiest done by car, which gives you the freedom to explore more hidden gems in the area and gets you from town to town. Public transport is essentially nonexistent in the area and taxis are only available in the Fort William area. Traveling alone to London or Edinburgh? Looking for a party and need a hostel in London?